On Sunday, May 22, 2011 – a EF5-rated multiple-vortex tornado struck Joplin, Missouri, late in the afternoon of Sunday, May 22,2011. 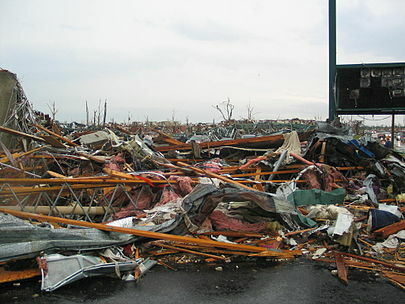 The massive tornado ripped through downtown Joplin, MO destroying 80% of the city. Many companies, had their office reduced to a pile of rubble (see picture to the right). Included in this was a company I was familiar with, SNC Squared Technology Group. Fortunately, all their employees and family are all okay. However, they are faced with a massive cleanup effort. And, they needed to help 20 of their medical clients (all physician’s offices) to get back up and running quickly. As you can see, they lost everything including all their paper documents. Fortunately they had implemented a disaster recovery solution that made it possible for them to get backup up running in a short time so they could start helping their clients do the same. Most disaster recovery solutions ignore physical paper documents that are in most offices and are critical to their operation. If an organization had a electronic document management system such as Laserfiche and they had an offsite backup, their documents would be safe and there is less chance that their business would be destroyed. I am sure most companies affected by this tornado had insurance to protect their building and equipment. Laserfiche could be your insurance for your critical paper documents. Very seldom does any one consider “what is the ROI on my business insurance”. The same should apply to a document management system. But, from time to time people ask me, “what is the ROI for Laserfiche?” If the picture above was your business, the ROI of Laserfiche document management software would be a no-brainer. ← My friends laughed at me when they heard I was going to be audited!